Powering a 79xx Cisco Phone with a Standard POE – Eines! A VoiP Phone Cisco 7040G arrived to my home (on another post I’ll explain why/how/etc) and the big surprise was that it has to be fed with an special POE from Cisco. It’s called pre-standard POE. I have a standard POE (802.3af) that fed properly my previous VoIP phone… and after connecting it to the 7940, the phone won’t boot up…A bit annoyed I bought the power supply of the damned 7940G (extra 15€ to the trash) which is called CP-PWR-CUBE-3. It arrived and the phone finally booted up. BUT I always go beyond things and don’t want to have extra cables around the VoIP phone (if previous was fed by a unique cable, why this damned Cisco has to have extra cables annoying on the living room?). So after a bit of research I found this interesting information: Cisco POE from voipinfo.org. It turns out that the 79xx series of Cisco Phones (Pre-Standard POE) can be fed with a standard 802.3af POE but with changed polarity. I tested it and voilà: It works! I can re-use my infrastucture (POE hidden – and the VoIP phone fed only by a single cable). This entry was posted in Tech and tagged 7940, cisco, poe, voip by Andreu. Bookmark the permalink. It works!!! Thank you so much! Thanks for this, any chance you can post the wiring scheme for 568a? I figured it out over the weekend. Posting here for anyone else that may want the solution. hi! 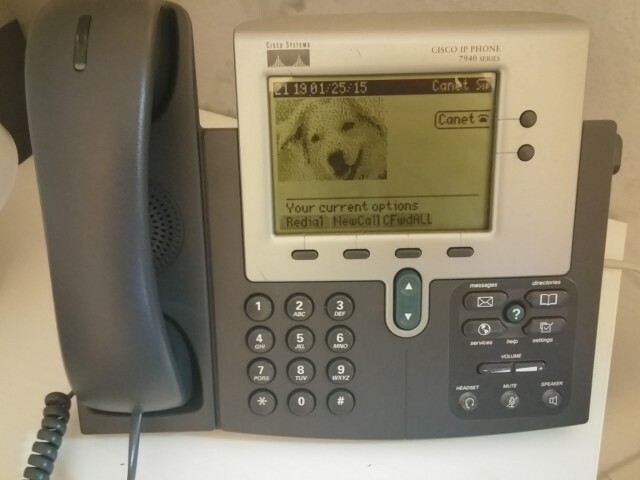 i have the exact same phone (cisco 7940) and tried out your custom RJ45, but my phone doesn’t power up. I’m using a Netgear GS108PP switch. Do you think there is something else i could try, apart from getting an old cisco catalyst poe switch?